Introduction to Astrophysics Lecture 4: Light as particles. 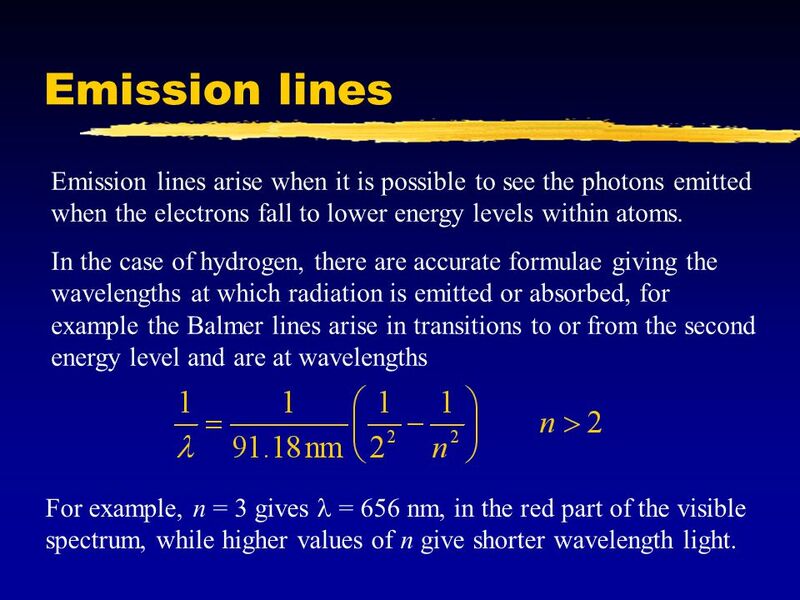 2 Emission and absorption lines A black-body is a continuous spectrum with light at all wavelengths. However a real spectrum (meaning the intensity of light plotted against wavelength) may show either bright or dark lines, or maybe even both. 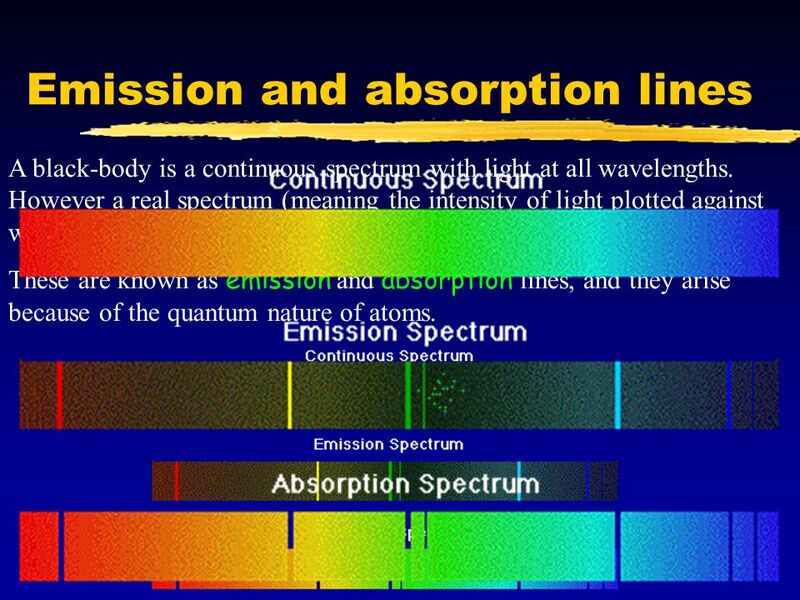 These are known as emission and absorption lines, and they arise because of the quantum nature of atoms. 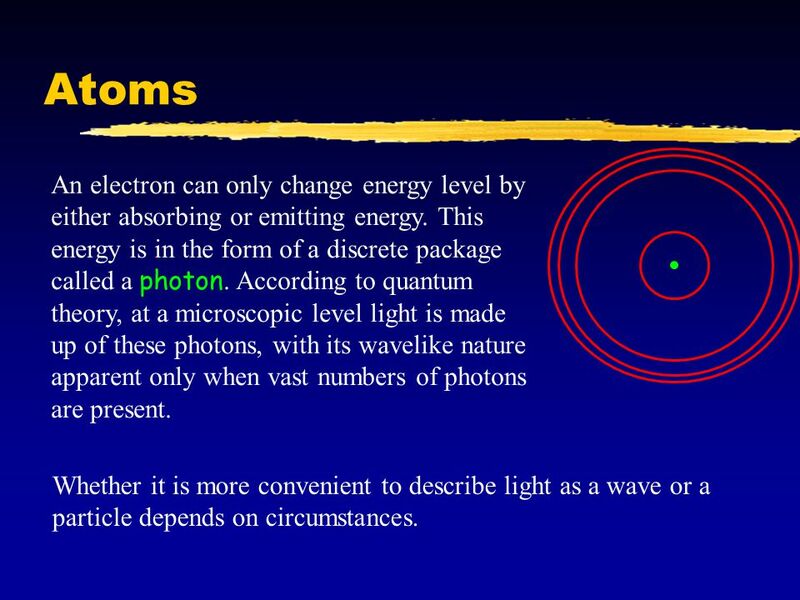 4 Atoms Whether it is more convenient to describe light as a wave or a particle depends on circumstances. An electron can only change energy level by either absorbing or emitting energy. This energy is in the form of a discrete package called a photon. According to quantum theory, at a microscopic level light is made up of these photons, with its wavelike nature apparent only when vast numbers of photons are present. 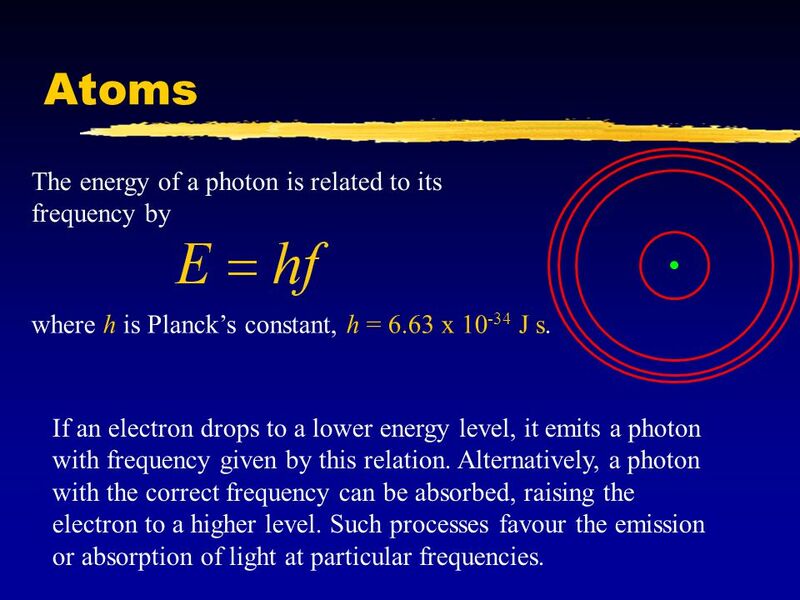 5 Atoms where h is Planck’s constant, h = 6.63 x 10 -34 J s. The energy of a photon is related to its frequency by If an electron drops to a lower energy level, it emits a photon with frequency given by this relation. Alternatively, a photon with the correct frequency can be absorbed, raising the electron to a higher level. Such processes favour the emission or absorption of light at particular frequencies. 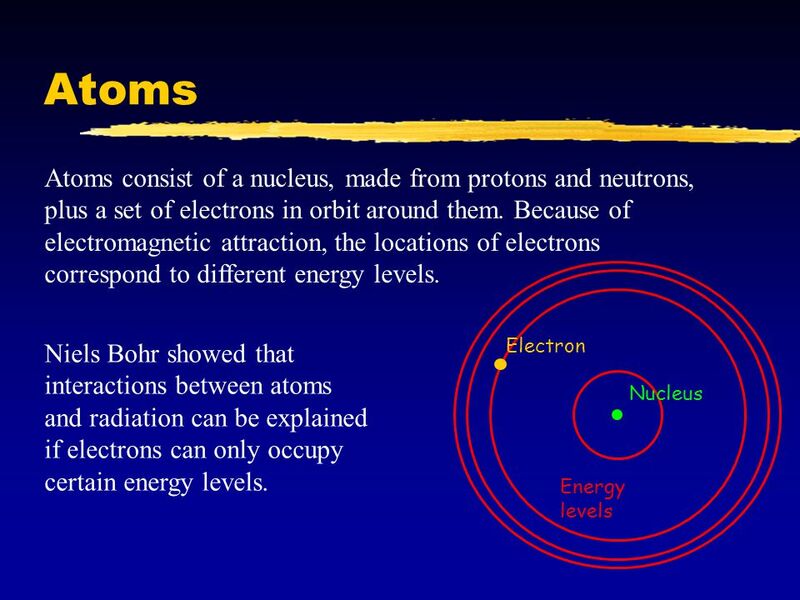 6 Atoms Study of these energies is known as spectroscopy. It is an invaluable astronomical tool as it can tell us about the types of atoms present in distant objects. Each type of atom has a distinct fingerprint. Each type of atom has a characteristic set of energy levels. That means these atoms can absorb or emit photons only at a characteristic set of energies, corresponding to the transitions between those levels. For example, the energy pattern of hydrogen is completely different from oxygen. 7 Absorption lines Absorption lines arise when the material we are interested in lies between a source of continuum radiation and ourselves. Source Dust cloud A classic example is the Sun, where radiation originating deep within the Sun is absorbed by material in the surface regions. 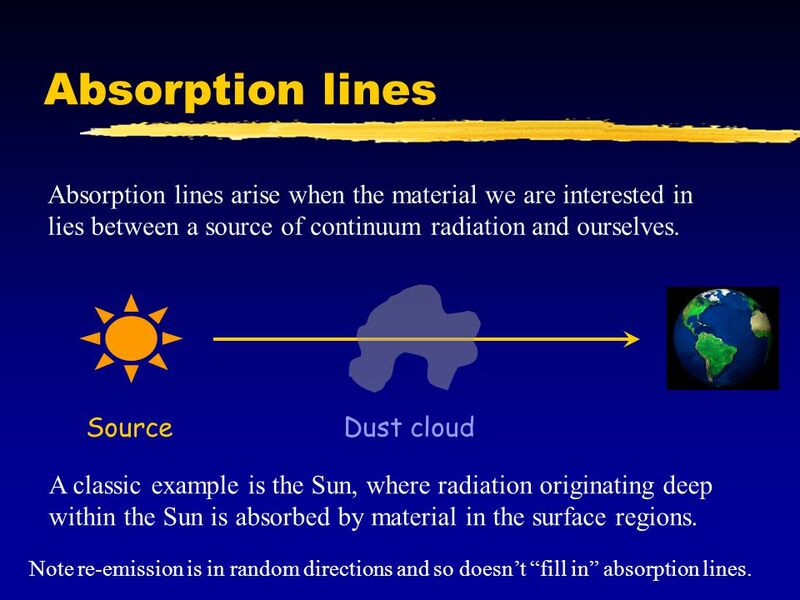 Note re-emission is in random directions and so doesn’t “fill in” absorption lines. 8 Emission lines Emission lines arise when it is possible to see the photons emitted when the electrons fall to lower energy levels within atoms. In the case of hydrogen, there are accurate formulae giving the wavelengths at which radiation is emitted or absorbed, for example the Balmer lines arise in transitions to or from the second energy level and are at wavelengths For example, n = 3 gives = 656 nm, in the red part of the visible spectrum, while higher values of n give shorter wavelength light. 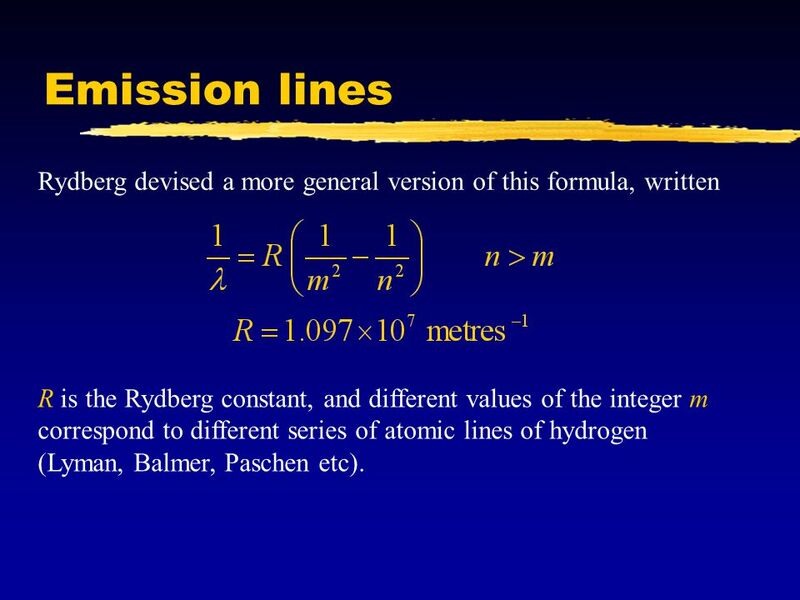 9 Emission lines Rydberg devised a more general version of this formula, written R is the Rydberg constant, and different values of the integer m correspond to different series of atomic lines of hydrogen (Lyman, Balmer, Paschen etc). 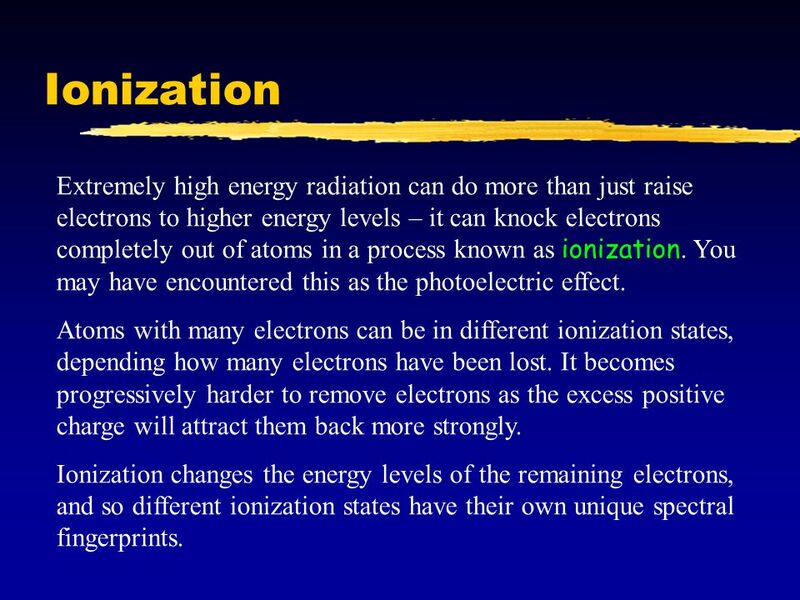 10 Ionization Extremely high energy radiation can do more than just raise electrons to higher energy levels – it can knock electrons completely out of atoms in a process known as ionization. You may have encountered this as the photoelectric effect. Atoms with many electrons can be in different ionization states, depending how many electrons have been lost. It becomes progressively harder to remove electrons as the excess positive charge will attract them back more strongly. Ionization changes the energy levels of the remaining electrons, and so different ionization states have their own unique spectral fingerprints. 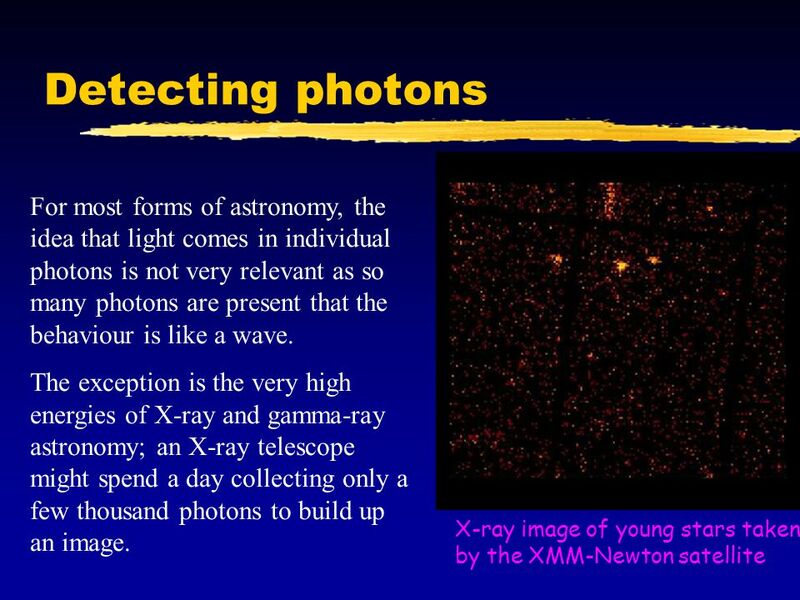 11 Detecting photons X-ray image of young stars taken by the XMM-Newton satellite For most forms of astronomy, the idea that light comes in individual photons is not very relevant as so many photons are present that the behaviour is like a wave. The exception is the very high energies of X-ray and gamma-ray astronomy; an X-ray telescope might spend a day collecting only a few thousand photons to build up an image. 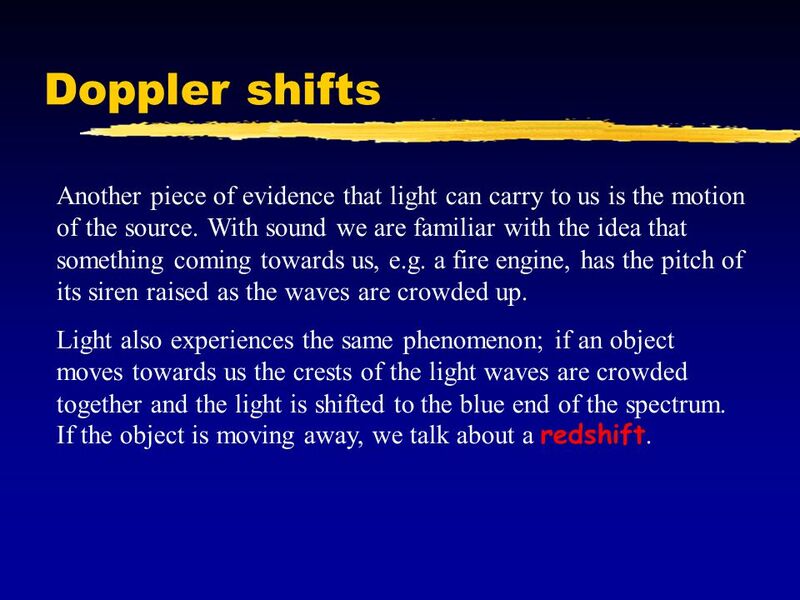 12 Doppler shifts Another piece of evidence that light can carry to us is the motion of the source. With sound we are familiar with the idea that something coming towards us, e.g. a fire engine, has the pitch of its siren raised as the waves are crowded up. Light also experiences the same phenomenon; if an object moves towards us the crests of the light waves are crowded together and the light is shifted to the blue end of the spectrum. If the object is moving away, we talk about a redshift. 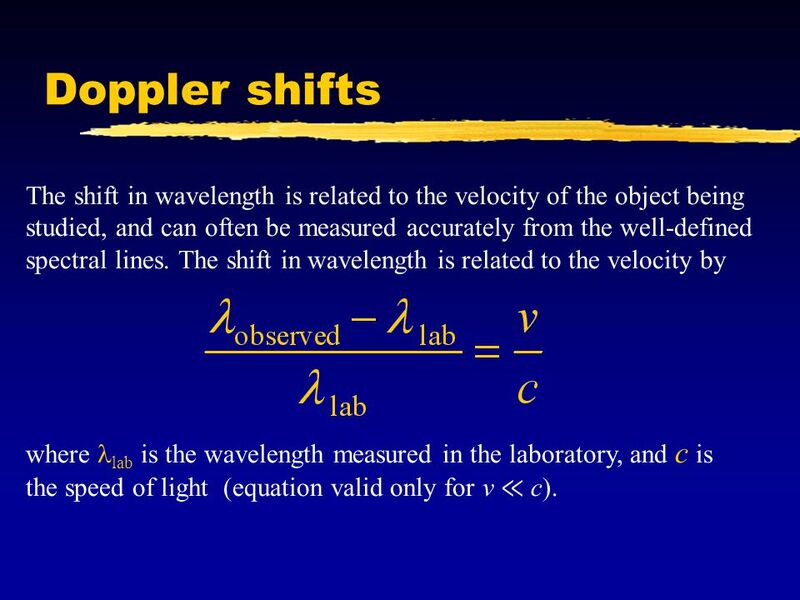 13 Doppler shifts The shift in wavelength is related to the velocity of the object being studied, and can often be measured accurately from the well-defined spectral lines. The shift in wavelength is related to the velocity by where lab is the wavelength measured in the laboratory, and c is the speed of light (equation valid only for v ≪ c). 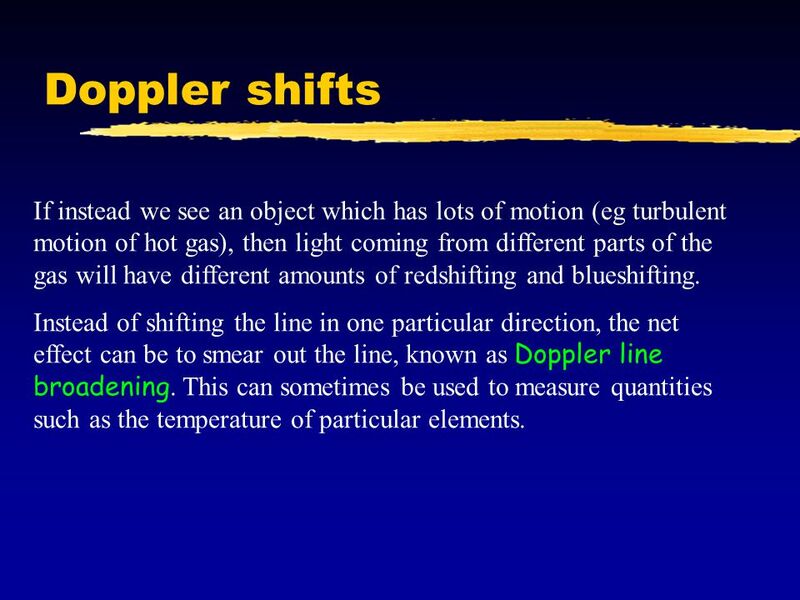 15 Doppler shifts If instead we see an object which has lots of motion (eg turbulent motion of hot gas), then light coming from different parts of the gas will have different amounts of redshifting and blueshifting. 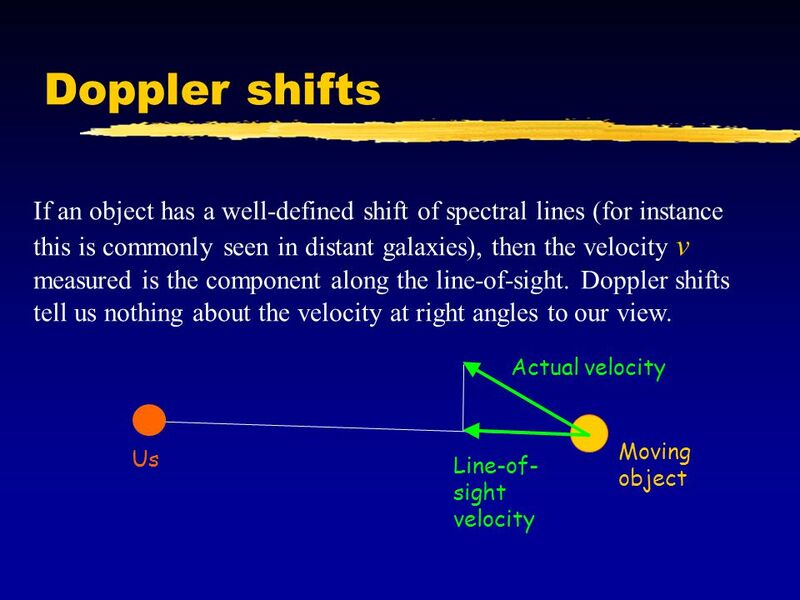 Instead of shifting the line in one particular direction, the net effect can be to smear out the line, known as Doppler line broadening. This can sometimes be used to measure quantities such as the temperature of particular elements. 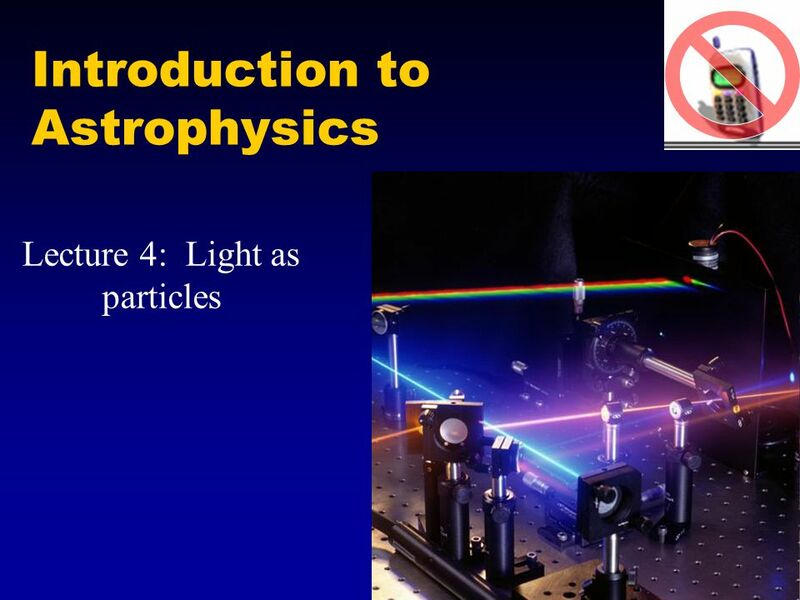 Download ppt "Introduction to Astrophysics Lecture 4: Light as particles." Astronomy Notes to Accompany the Text Astronomy Today, Chaisson, McMillan Jim Mims. The Amazing Spectral Line Begin. Table of Contents A light review Introduction to spectral lines What spectral lines can tell us. Universe Eighth Edition Universe Roger A. Freedman William J. Kaufmann III CHAPTER 5 The Nature of Light CHAPTER 5 The Nature of Light. The Nature of Light Chapter Five. ASTRONOMY 161 Introduction to Solar System Astronomy Class 10. NOTES FOR THE DAY: Waves: Characteristics: wavelength, λ--distance of repetition (crest to crest). frequency, f--no. of complete cycles passing a point. Chapter 5: Light: The Cosmic Messenger. What is Light? Light is radiative energy Energy is measured in Joules Power is measured in Watts 1 watt = 1 joule/s. Electromagnetic radiation Recap from last time: Light travels at 300,000 km/s. It is a form of electromagnetic radiation. Beyond the range of what the. The Nature of Light Chapter Five. Determining the Speed of Light Galileo tried unsuccessfully to determine the speed of light using an assistant with. Astronomy 101 Section 020 Lecture 5 The Nature of Light John T. McGraw, Professor Laurel Ladwig, Planetarium Manager. 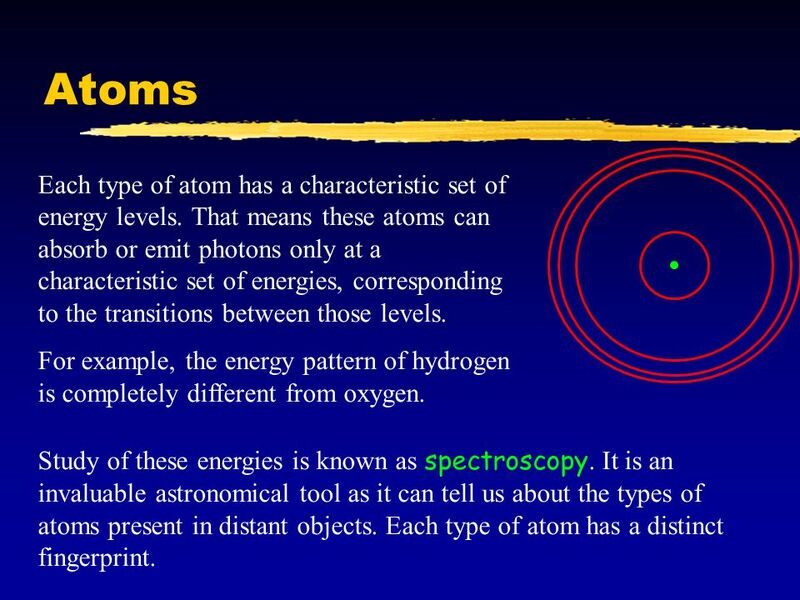 Atomic Spectroscopy Introduction To The Textbook “Atomic Astrophysics and Spectroscopy” (AAS) Anil Pradhan and Sultana Nahar Cambridge University Press. Astro 201: Sept. 14, 2010 Read: Hester, Chapter 4 Chaos and Fractal information on class web page On-Line quiz #3: available after class, due next Tuesday. Light. What is Light? The third form of energy The only thing astronomers study Electromagnetic radiation The thing that our eyes detect How radio works. Spectra PHYS390 (Astrophysics) Professor Lee Carkner Lecture 4. ISP Astronomy Gary D. Westfall1Lecture 6 The Nature of Light Light and other forms of radiation carry information to us from distance astronomical. Astronomy 1 – Winter 2011 Lecture 8; January 24 2011.